How to configure optifine in minecraft? Many fans of Minecraft are faced with the fact that I can't fully enjoy the gameplay. The game is an infinite number of times hangs, graphics are displayed far from ideal. This is not to forget that Minecraft is the game not very "heavy" and not suitable even for the most modern computers. How to fix lag in it and improve its graphics? If you are experiencing the above problem with fps (frame rate per second - that it in many cases of "guilty" in the hang of your favorite game), pay first attention to the Java settings. Often even the owners of very powerful computers with incorrect operation of this software platform are faced with countless lag in Minecraft. Sometimes the catch is that the driver does not match the bitness of your Windows. Right-click on "My computer", select "Properties" and check the 32 - bit or 64-bit system you have. Delete not relevant to this indicator, driver and install adequate. If you find that the problem absolutely is not: the software is coming to the bitness of Windows and fps in "Minecraft" are still far from the norm, make sure you have enough allocated RAM for Java. Go to the control panel of this software in the following way. When you have XP - using disk or file Explorer, and in Windows 7 - control panel (through start menu of the computer). Open the Java control panel, there is a tab and there click View. In the window that appears should be only one line. If more than one, uninstall Java and install a more modern version. Now again in the same way go to the control panel of the aforementioned software platforms and in the blank line with the Runtime Parameters enter the required parameters to RAM. They depend on the total amount of RAM on the computer. If, for example, is 4 GB, enter the following values: -Xms1024M -Xmx3072M. The first digit will correspond to the minimum amount of "RAM", and the second - most eye-catching for the game. However, the above values will be useful to you if you have 64-bit Windows. When all 32 bits, specify -Xmx for not more than 1 gigabytes (for example, 972М). After all the above changes click OK and then Apply. Then Minecraft you should make much faster and without lags. However, if any changes in this plan will not happen, try to install a special program - Game Booster. It produces a defragmentation of the game files and folders, disable unnecessary apps and clears the RAM, releasing her hitherto unexploited volumes and thereby increase fps. In addition, it automatically searches and updates required for the early operation of the gaming programs drivers. Use a special mod OptiFine to dramatically improve game performance. 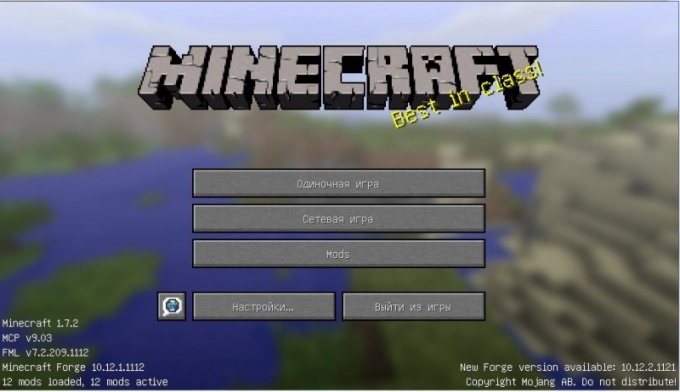 Set it to any appropriate version (e.g., 1.6.2_С4 and later put the contents of the archive with the aforementioned plug-in mods your Minecraft Forge). Adjust the in-game menu, the distance of the rendering image, the level of smoothing lighting, methods of loading chunks and a number of other graphic parameters. Now, when you go into the gameplay, you have it will be without the hated lag. Install Game Booster it will make sense, if you computer is weak, and it is clear the memory from unnecessary files and their fragments helps to improve the functioning of Minecraft. On the powerful processors of the impact of the above-mentioned program you actually wouldn't notice. For maximum performance of the game application, unplug the stars, fog, sky, clouds, all the animation, set a short distance render and fast graphics.